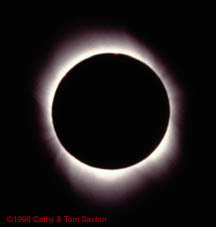 On February 26, 1998, we were treated to an awesome show as the Moon slowly obscured the Sun and we experienced a total solar eclipse. See our log and photos of the event. 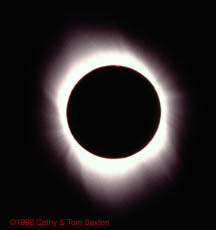 Watch a QuickTime movie of the eclipse (396k). (Can't play QuickTime movies? Here's a link to Apple's QuickTime Page). The amazing spectacle of the Moon eclipsing the Sun creates a wide variety of details and brightnesses that no single photograph can capture. 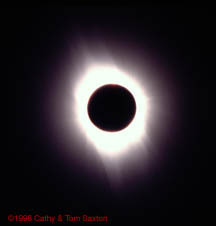 Exposures long enough to capture the outer corona will overexpose the inner corona so much that detail is lost. The following photographs cover a range of different exposures and show some of the highlights from the eclipse. The prominences and the whole extent of the Sun's corona are all visible during totality -- the photos vary only because of exposure time. 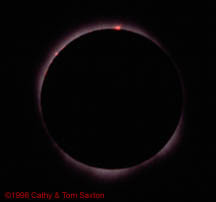 The prominences (red spots) are flares from the Sun that extended beyond the Moon's edge. Note the "polar brush marks" in the upper right and lower left. Note the faint wisps extending far from the Sun's center. This photo was taken as totality was ending and the Sun was beginning to emerge from behind the Moon. It was too bright to look at directly; I was watching through a filter and just hitting the camera's cable release. We were on the northwest tip of the island of Curaçao, a Caribbean island off the coast of Venezuela. The above photos were taken with a Canon EOS Elan II using Kodak Elite II 400 ISO color slide film and a 500mm Tamrac mirror lens (fixed f/8). The slides were scanned into Adobe Photoshop using the Minolta Dimâge Scan Dual. Because of windy conditions at our site, we were concerned about blurring during longer exposures. So, we decided to use faster film and accept some graininess in exchange for reducing the chance of fuzzy photos. 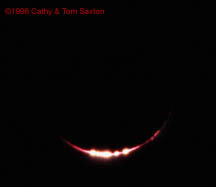 All photos Copyright (c) 1998, Cathy & Tom Saxton. All rights reserved.